During the holiday season here in California, the Poinsettia is the most celebrated flower most associated with Christmas. Used in floral arrangements on holiday tables, also seen on house porches everywhere, they can be seen in different colors and patterns splattered all over business windows and malls. This holiday flower came to the U.S. from Mexico by an American botanist, physician and Minister to Mexico, Joel Roberts Poinsett in 1828. It was then further developed by Paul Ecke and currently grown here in Encinitas at the Paul Ecke Ranch. Poinsettia Day was established in July of 2002, by the House of Representatives in honor of Paul Ecke Jr. who is considered the father of the poinsettia industry. Today, the ranch is run by Paul Ecke the III. The plant has many meanings and uses in Mexico, and can be found in celebrations including the December 12th, Dia de la Virgen, and even goes back to the Aztecs when they used the plant as a red dye. The sap was also used to control fevers. To read more about this holiday visit: Poinsettia Day. I decided to go visit our local nursery where I could take several pictures of the different varieties available to us in the area. 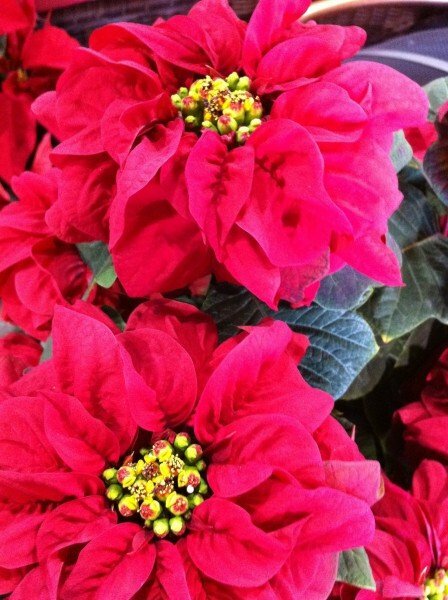 Living so close to the Ecke farm, our stores do have a wide selection of Poinsettias to choose from. If you’re ever in the San Diego area during the holidays the Ecke Ranch is open for holiday tours from November 28th -December 2nd. Below I found this short video of the Ecke Ranch and how they develop new varieties and grow these beautiful flowers in their greenhouses. This video takes you to the Paul Ecke Ranch in Encinitas. It’s quite a treat to visit theses greenhouses and view how this holiday favorite is grown. I have written warm and poignant screenplay about a loving family of farmers and the people of a small town in the highlands of Mexico. I entitled it “Poinsettia The Christmas Flower.” It is base on a familiar folklore of how the poinsettia became to be and is enriched with the culture and characters of a small farming community including one particular family who must leave their village for a larger town for medical attention leaving behind their son, Emiliano to tend the farm with his aging uncle. As Christmas Eve arrives he is desperate to find a gift for the baby Jesus and in desperation gathers a bunch of weeds and lays them at the alter where the miraculously transform into a beutiful Poinsettia. The story is filled with warmth, humor and pathos and in the end the faith and love for family is the overpowering force symbolized by the beauty of the poinsettia. i will be most pleased to send you a copy if only for your feedback. I believe it could become a very effective marketing icon. I have ambitions of producing it with family oriented programs such as the Hallmark Channel. I would be so excited to hear from you regarding any criticisms, ideas and any interest in lending energy into the film. Thank You, Richard Espinoza.